Art at Morton College. Rita Grendze. Rita Grendze is a sculptor making artwork from ordinary objects. Both her undergraduate and graduate degrees are in Fiber art, which for Grendze has translated into a lifelong love of process: even during dry periods for creating art, her hands remain busy, learning new techniques, exploring materials expanding her visual language. Grendze is the youngest child of Latvian immigrants. She was born in Canada, but grew up in Lakewood, Ohio, where her family was immersed in the immigrant culture and Lutheran church. Grendze graduated from the Cleveland Institute of Art in 1987, after which she spent time living in Europe, eventually returning to the United States and moving to New York. Upon finishing her graduate degree at Cranbrook Academy of Art, Grendze was awarded a Fulbright Scholarship for study in Latvia. She spent a year there with her husband Andris, returning to once again settle in New York City. During her decade in New York, Grendze worked for the American Institute of Graphic Arts, taught at Maryland Institute, College of Art in the Fiber and Foundations departments, as well as at New Jersey City University. Since moving to the Chicago area in 2001, she has worked with Redmoon Theater creating props for outdoor spectacles, has taught community workshops in Chicago and the suburbs, has completed commissions, costumed plays, had large-scale work funded, and shown her work regularly, but the bulk of her time has been dedicated to her studio practice and to her young family. In her own, completely subjective estimation, her best work has been created right here in Illinois, where she has maintained a working studio since 2010. Earworms. We all experience them: uninvited tunes, even little bits of melodies that invade thoughts and sit in the subconscious, bubbling up when least expected and quite often, least wanted. Music can be pervasive in a way that other art forms can’t: speaking to us in non-verbal language, a language that can be felt physically and emotionally, as well as engaging us in an audible experience. So who decides that a song is worth singing? 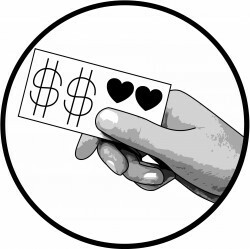 Who dictates which music is worth remembering and treasuring? Most of my artwork is made of abandoned objects: thousands of books, hundreds of shovels, dozens of steel spheres, or in this case, box upon box of choral sheet music. I find that when presented with a collection of like objects, I immediately start to catalog them in some way. I try to find a system to make sense of the abundance. This is an important part of my research when developing new art work: touching the collection, ordering, stacking, and at times breaking the stuff. I gain understanding of the materials through physical manipulation. I forget, for a time, where the materials came from, what the materials were used for originally. And yet, at some point, I reengage with each collection’s context and recognize the stories innate in the objects. While I feel strongly that all stuff, natural or man-made, has integrity, I am not always comfortable making the known content, the assumed meaning my own. I acknowledge this kind of disconnect when it exists. I aim to always be respectful of the materials and their past, grateful to those that have shared their collections with me. In Unsung, I am visually creating a crescendo to mimic the dynamics we hear in beautifully performed music. A piece that starts out calm, controlled, and contained (even when there is an underlying urgency), can then percolate to the point of boiling over and becoming expansive. The sheet music became both the subject matter and the material for this piece, growing from my drawings of the music (a note-less score) to sweet chorales and impassioned anthems, but eventually drifting into a moss-like fragmentation of songs. While I am assuming that the music lives on long beyond any printed record or notes on how to perform it, Unsung is exploring a song’s life cycle and leaving us with only the seed of what the music was: a visual earworm. 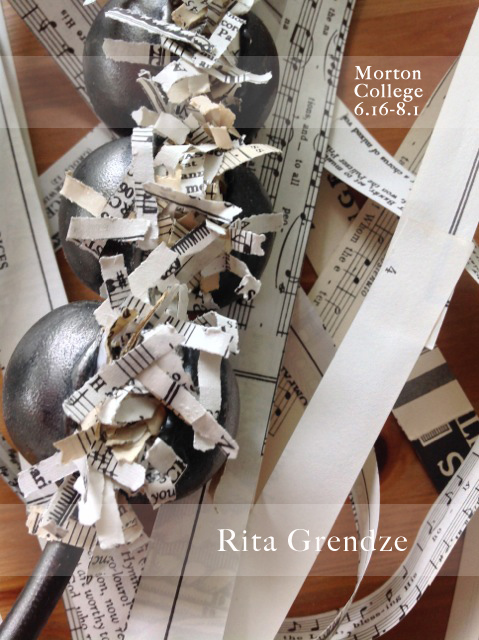 Rita will be displaying her newest piece called Unsung, an on-site installation made from re-purposed music sheets and other materials. You can view this installation at Morton College. 3801 S. Central Avenue, Cicero, Illinois 60804. Building C First floor, across from the bookstore. This exhibition is free and open to the public. This entry was posted in Art at Morton College, Creating and tagged art, Art Installation, artist, arts, Chicago suburbs, Cicero, Community College, Contemporary Art, creating, creativity, curated, Diana Gabriel, morton college, music sheets, repurposed, Rita Grendze, sculpture..
Art at Morton College. Sam Jaffe.